Having known TC Avey via Social Media (@TCAvey1 on Twitter) for several years now, reading her blog and interacting with her socially, I was very excited to find out she was writing a book. 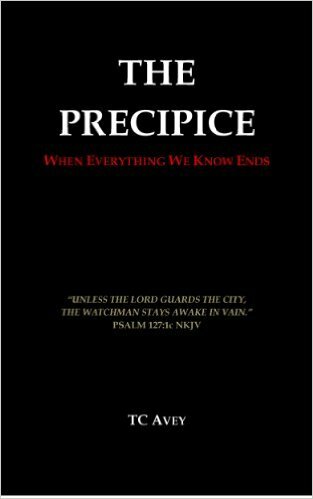 I was gifted a copy of The Precipice: When Everything We Know Ends in exchange for an honest review. I read the book in ONE sitting. Easy to keep up with,expertly written and I have to say, each scenario is completely possible in this day and age. While this book is a work of fiction, TC has done her homework with these three short stories and honestly the things in her book could become reality for many. These stories easily get your attention as specific freedoms are challenged. I would suggest using the Reality Check section at the end of each story in this book in a Bible study settings to prompt discussions about the events she covers as well as family time discussions. As you read her book, search your own heart and think of what you would do should everything as you know it….change. Here is an interview TC has graciously given me. 1. What prompted you to write this book? I’ve always been passionate about Current Events, History, and the Word of God. A few years ago God began tying these together so that each news story or history lesson I read, I saw God at work. I was troubled when I began to see the path America, and the world, is on. I found comfort in 2 Chronicles 7:14 but I felt compelled to do more. But what was I to do? After church one day, God gave me this message. It took months of prayer, research, and seeking God before this book became a reality. More than once I tried tabling this book and saying it wasn’t the “right time”, but I had no peace when I did this. Continually God brought me back to Jeremiah 20:8-9. I can’t keep this message inside. It must be spoken. How it is received isn’t up to me. I must do my part and trust God to finish what He began. God is speaking to His people…are we listening? 2. Each person has gifts given to them by God to aide in their calling. How did you know you were called to write? I’m not sure. Some people hear a voice from God. Some people know from a young age. There are countless books/resources out there to help you discover your gifts. Each Member in the Body of Christ has gifts and those gifts are meant to bring glory to God. For me, I can’t NOT write. I love writing. I love reading. I love learning. Those are things God placed inside me. But I’ve not always used them for His glory. I wrote for years, but it’s only been since 2011 that I’ve been courageous enough to share my writings with the world through my blog, Wisdom of a Fool. I guess my answer to those seeking to know their gifts and calling is ask yourself, what passions has He placed inside me? What do I enjoy doing? When I began my blog, I had no idea God would lead me to write this book. But this book takes all my passions (reading, writing, research, God) and brings them together, hopefully all for His glory and not my own. 3. Explain how your book encourages people to be more active in their faith. When we accept Christ as our Savior we are a New Creation. That New Creation longs to please God, to do good works, to bring Him glory. We can never earn our Salvation, but when we begin to grasp all that God has done for us, we can’t help but share that Good News with the world. Our flesh wars with our spirits and this world does a wonderful job of distracting us from the Great Commission we are each given. It’s my prayer that people will read my book and be inspired to KNOW God more. To follow Him. To dedicate their lives, energies, talents, time and so on to the One who gave Himself for us (John 3:16-17). Truth is, our lives aren’t about us. They are about the One who purchased us, who redeemed us from our fleshly desires. It’s time we wake up and stop living our lives for ourselves and begin being a City on a Hill. I hope my book helps people analyze where they place their trust. 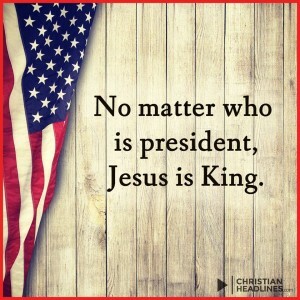 Anything other than the solid foundation of Christ won’t stand. 4. If people take one thing away from your book, what do you hope it is? Not to fear the trials and pains of this world, but cling to the Word of God. For God’s Word to be ALIVE in them. Jesus says that in this world we will have tribulation, but we can have hope and joy because He has overcome the world (John 16:33). This type of hope and joy can only be found in a RELATIONSHIP with Christ, not a religion. 5. How can people maintain their joy when there are so many troubling things in the world? By NOT focusing on what is transpiring in the world. Focus on the Word of God. This seems contrary to much of my book highlighting Modern Events. However, it’s true. God’s Word must be our source and foundation. That being said, I think it’s imperative people also know what is going on in the world. How can we know how to pray? How can we see the signs described to us in Matt 24, if we don’t pay attention to the birth pangs transpiring around us? How can we encourage others, if we don’t know what it is they are burdened with? God’s Word must permeate our minds and souls, but we can’t neglect to stay informed if only so we can help others who are burdened down with the cares of this world. Also, one must never operate their lives from a position of fear. Fear is satans tool to immobilize us. But God, who is perfect love, casts out fear. Cling to that Love. Stay in the Vine. TC Avey is a Christian devoted to God, family and friends. She is passionate about encouraging Christians to live a life dedicated to Christ as well as helping them understand the importance of preserving our national freedoms through knowledge and love. She blogs at Wisdom of a Fool (tcavey.blogspot.com). You can also follow her on Twitter (TCAvey1). Her book, The Precipice: When Everything We Know Ends, is available on Amazon. You can also check out her book on GoodReads. I highly recommend this book. I hope you’ll read it, spend some time in thought with regards to the events listed in the book and then share it. Thanks TC for this opportunity to share The Precipice: When Everything We Know Ends. *No compensation was received in exchange for this review. All opinions expressed are my own. I was not required to give a positive review. You can purchase a copy via Amazon here. What will you do when your basic Christian Freedoms are challenged? Get the book, think about it. Is a remarkable daily devotional divided into 10 weeks that covers various topics to help you clearly see that you were fashioned by God for more than you could have ever imagined. In this crazy world we live in you are easily reminded of your faults, your issues, your troubles but THIS devotional has been written to help you see the best in yourself so that you can focus your energy on what God wants you to be and His desires for your life. I’ve said it a million times and I’ll keep saying it, the negative is so easy to see! 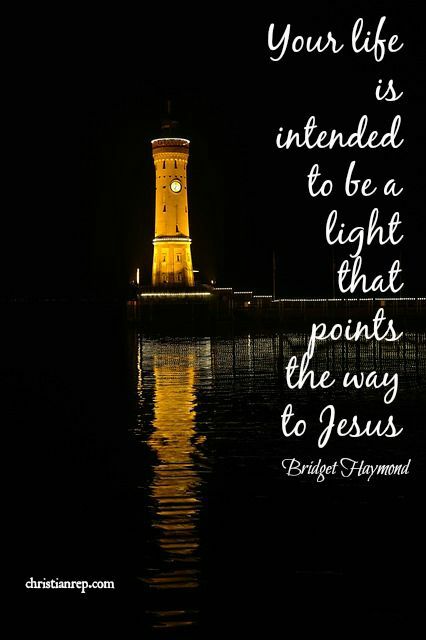 Author Bridget Haymond has written this devotional in such a way that each day you’ll be able to see beyond the negative as you look deeper into what God truly created you for. She has crafted daily devotions that are easy to read with thought provoking questions at the end that are for men, women and even teens. Your pre-teen looking for their purpose, for direction? Get this book for them and take time daily to read and discuss it with them. She has laid it out with topics that flow from day to day in such a thoughtful way so that you are not overcome, yet you are looking into the positive, the talents and good that God has created you for. I love that she ends each week with a weekly reflection. This is awesome for the group discussions, or parent/teen discussion that you can have. Your youth group will benefit from it, your Sunday school, small group or even your personal daily devotional time. This study can easily be broken down into a 4 week study by reading 2 pages a day. Many feel that they cannot maintain a long 10 week study, but this book will not leave you feeling that way. You can easily modify this to fit your study group’s need. What are your needs? Do you feel that you are looking for more from God? Do you feel that He has fashioned you for more and you just don’t know what it is? Then you should get this book and dig in! I’ve know Bridget for years and have had the privilege of sharing many cups of coffee, laughs and the warmest hugs with her! Her coaching skills are amazing, her love for helping people to draw closer to the Lord makes my heart smile and I KNOW that you and your group will love her devotional! 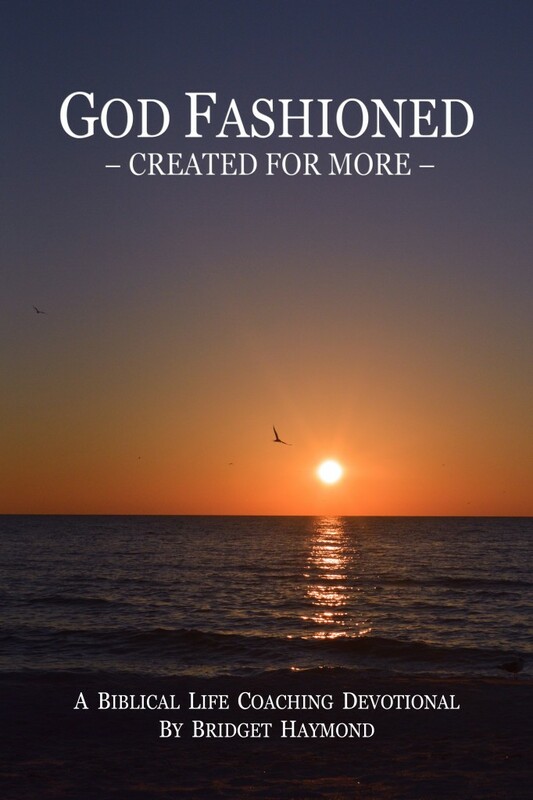 YOU Were Created for more! God Fashioned you for such a time as this! I’m giving away a copy of her book! All you have to do to be entered to win is leave a comment. Winner will be drawn August 24th 2015. That’s right…nothing to fill out, nothing to click, nothing to extra other than say hello in the comments below. I just love easy! Brings me great JOY. Rather than merely seeking gifts from the Lord, make it your goal to enjoy a vibrant relationship with Him first and foremost. God offers us real life with the added benefit of friendship with Him. Ultimately, choices reflect heart attitudes and values. While growing up in Christ requires self-control, faith and endurance, it also involves learning to rest in His grace. Here are some ways to get to Know Bridget Better, and honestly, I hope you do. You’ll be glad you did.